Compact IC-7800 Mini-Manual. 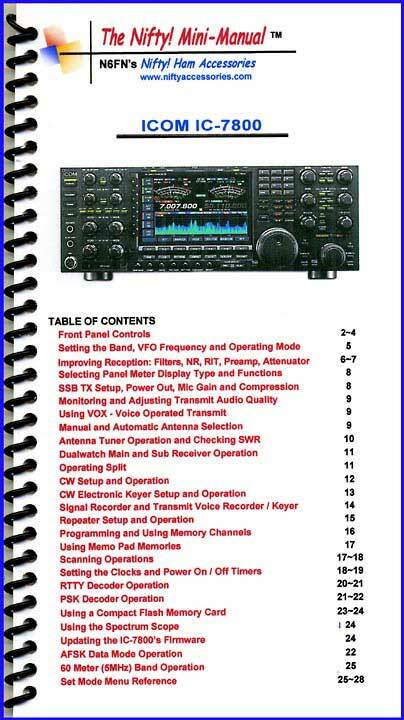 Comprehensive operating guide for the IC-7800. Size, 4.5x8 inches. Twenty-eight high-quality laminated pages, loaded with detailed instructions. Ideal for setting-up and operating this feature packed rig. Instructions for using all menus and modes of operation. Includes changes for the Ver 3.00 firmware upgrade, Ver 3.01 maintenance release did not affect instructions in the Mini-Manual.